Everyone’s favourite forgetful blue fish is back at last for ‘Finding Dory’, and now YOU can take Dory and her friends home with you for your very own underwater adventure as ZURU launch their ROBOFish collection inspired by Disney-Pixar’s box office record holder film! 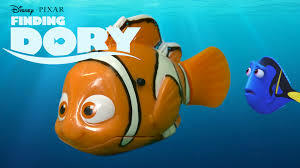 The new ROBOFish Finding Dory toy range features Dory, Nemo, Marlin and new character Bailey from the film! 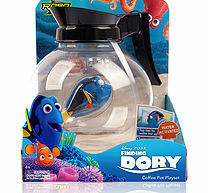 The range also includes a Dory Coffee Pot Playset with ROBOFish Dory included just like in the movie and a Nemo Track Play Set complete with ROBOFish Nemo! ZURU’s ROBOFish Finding Dory toys swim just like real fish! Simply drop Nemo, Dory, Marlin and Bailey into water and watch them swim, swishing their tails from side-to-side whilst exploring their aquatic environment, just like the film! Remove the fish from the water and they’ll automatically stop, ready to be stored away for their next underwater adventure! Thanks to ZURU’s innovative technology all characters feature a “power save” mode and will automatically switch off after one minute to save battery power. With the all-new ‘tap-tap mode’, just tap the side of the tank to reawaken your fish and enjoy more underwater fun! Scroll down to watch the video of them in action! !